Before you continue reading, please take time to LIKE and SHARE "Voice for the Deaf", the Official Facebook Page of Rossking Pty. Ltd, the Philippine office of Australian IT firm New Media Services, on its interest to provide deaf pupils at Special Education (SPED) Center Baguio a more comfortable learning environment. When the previous academic year ended last March, students at Special Education (SPED) Center Baguio in northern Philippines thought they would use the same plastic chairs and dripping ceiling when they return. 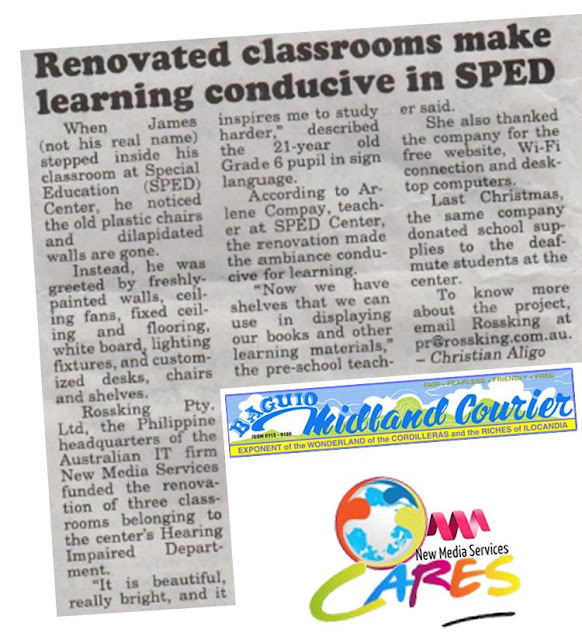 But when classes started in June, students belonging to the center’s Hearing Impaired Department were delighted to see newly-painted walls, customized desks, chairs and shelves, and fixed ceiling and flooring with lighting fixtures. “It is beautiful, really bright and it inspires me to study harder,” described James (not his real name), a 21-year old sixth grade student, in sign language. Baguio Midland Courier ran the story!